Stay up-to-date with what’s going on at SalesProcess360. Interested in having Brian Gardner speak at your upcoming event? Call 504-355-1150 or learn more. Association Meetings. Seminars. Speaking Engagements. Webinars. April 25, 2017: CRM Evolution 2017, Washington, D.C. Learn more. April 24, 2017: Brian Gardner will speak at the MCAA Industry Forum in Atlanta, GA.
April 11, 2017: LSU Executive Education Professional Sales Certificate Program. Learn more. March 1-2, 2017: Sales GPS 2017, Austin, TX. Set a new course for your distribution sales model with this executive workshop focused on thinking differently about field sales. Learn more. Dec. 13-15, 2016: Stop by booth 5092 at the Power-Gen International event in Orlando, FL. Nov. 1-2, 2016: Brian Gardner will speak to the Automotive Aftermarket Product Expo in Las Vegas. Oct. 2-4, 2016: Brian Gardner will speak on sales process as a competitive advantage at the NetPlus Alliance annual meeting in San Antonio, TX. Sept. 27-30, 2016: Fall Meeting – SalesProcess360 will have a tabletop for this event. Stop by to say hi and pick up some great resources for your company. Sept. 18-21, 2016: SalesProcess360 will be in the tabletop showcase. Stop by to say hi and pick up some great resources for your company. Sept. 13, 2016: Brian Gardner will speak on the topic: “Get in the Driver’s Seat: How to Take Control of Your Sales” for the monthly MCAA webinar. Learn more. Aug. 25, 2016, 1-2 p.m. 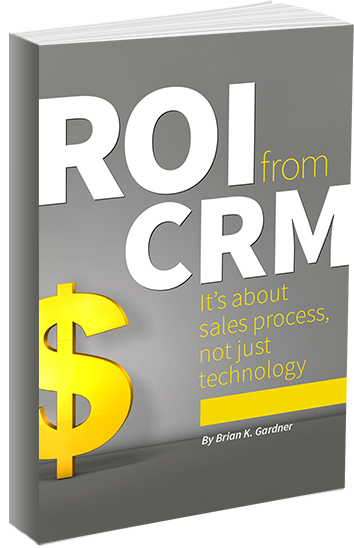 ET: Brian Gardner will present the first in a quarter webcast series on getting ROI from CRM. Learn more here to access the live or on-demand event. June 17, 2016, 1-2 p.m. CT: SalesProcess360’s Brian Gardner will be giving a free members-only webinar for the Power Transmission Distributors Association on how sales process can provide a competitive edge. Are you a PTDA member? Learn more here. April 17-19, 2016: Brian Gardner spoke on the topic “Is Your Sales Team Ready for 2020?” at the MCAA Industry Forum in Nashville, TN. Brian Gardner, founder of SalesProcess360, was a faculty member for the 2016 University of Innovative Distribution. March 4-5, 2016: Brian Gardner spoke twice at the Retail Packaging Association’s annual event.